Sometimes, checking Twitter pays off. Especially on Wednesdays, if you’re following one of Salt Lake City’s most popular food trucks, Off the Grid SLC. You could be one of the five lucky followers to sample the ever-changing, always over-the-top Underground Special. Off The Grid SLC is known for being adventurous when it comes to food, using local ingredients to provide a fun, unique experience. Off The Grid makes waffle sandwiches (yes, with two waffles as the bread) like the Kickin’ Chicken (portable chicken and waffles) and the Bee’s Cheese: Beehive Cheese’s Barely Buzzed, with its hints of lavender and espresso, melted between two Parmesan-crusted waffles. My favorite is the vegan Mount Olympus, a tasty Mediterranean wrap made with mashed chickpeas, sun-dried tomatoes and Kalamata olives topped with avocado, red onions and tomato. With that as the “regular” menu at Off The Grid SLC, you can imagine what the Underground Special is like. “The underground special started as a challenge from Salt Lake City’s Downtown Alliance,” says Off The Grid SLC co-owner Trevor Fuchs. “They were dying for someone to bring NYC’s famed ramen burger to SLC, and asked—albeit jokingly—if we would do it. So the next day, the Ramen Waffle Sandwich was born.” Off The Grid’s first special, the sandwich was two waffles made with ramen noodles, stuffed with roasted chicken, mango, avocado and a fried egg. 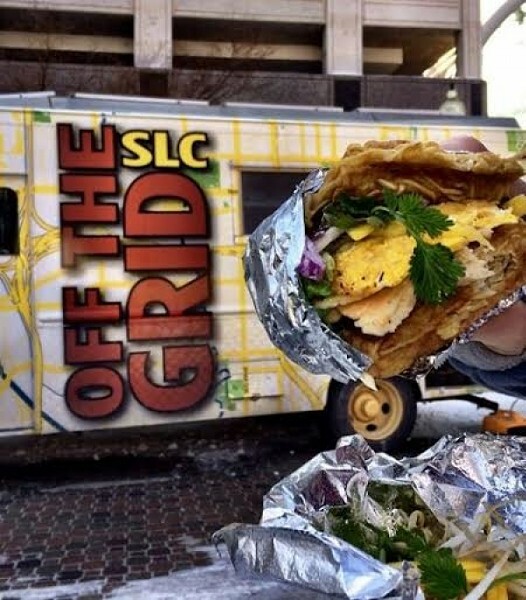 Every Wednesday afternoon, Off The Grid SLC sends a tweet (@OffTheGridSLC) offering a free Underground Special during Food Truck Thursday at Gallivan Plaza. The first five to respond will soon be happily stuffing their faces with some crazy waffle goodness. There is a catch—you’ll need to post a picture on Instagram, Twitter and Facebook. But really, with food this interesting, wouldn’t you do that anyway?